Welcome to Baguio Midland Courier’s Online Advertising Information Page. Click on any of the images below to enlarge. Frequently Asked Questions follow below. 1. What are the type of advertisements can you avail? A. PREMIUM HOME PAGE ADS – Our Premium Ad space offers maximum visibility for your Ad. With this offer, you actually get two ad spaces for the price of one. First, you get a “button ad” (a block of ad that serves as a teaser). You can choose to have your button Ad show either at the a) home page (where majority of our average 11,000/week traffic go to first), or b) inside article pages (at the end or beside full articles, the place where our visitors actually read stories). 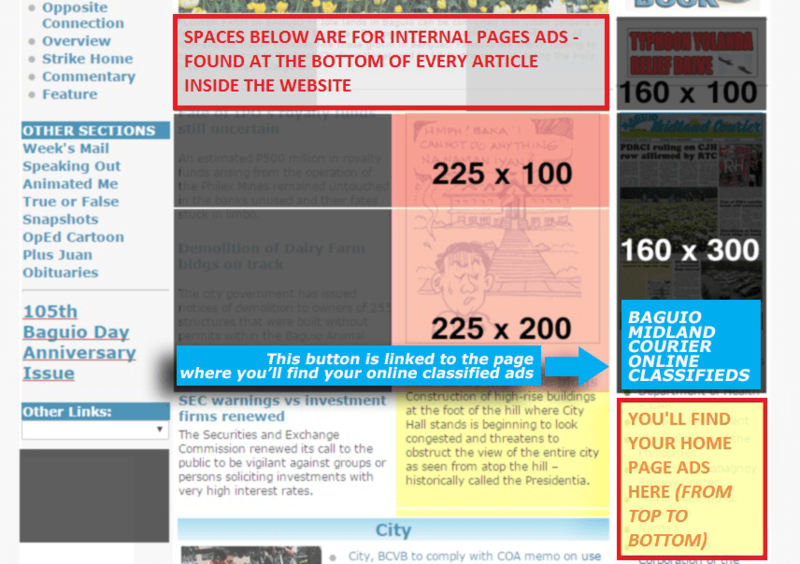 When a visitor clicks your button Ad, your visitor will be redirected to your main Ad (bigger and more detailed). NOTE: You can get 50% OFF of Premium Home Page Ad rates if you advertise in our newspaper publication too (any size will do). B. ONLINE CLASSIFIEDS – If you’re already advertising with us in the newspaper (including public notices, obituaries, etc. ), for only 100php (for smaller Ads), or as low as 10% of your ad rate (for bigger Ads) – we’ll have your existing newspaper ad appear in our dedicated “online classifieds” page too, with no additional work on your side. Contact us and we’ll give you a quote. Price: Starts at 100php for smaller Ads coming from the newspaper. For bigger Ads from newspaper, the price is 10% of your existing newspaper Ad rate. 2. Where will you find your advertisements? 3. What if you don’t have a graphic artist to design my online advertisement? You can have our in-house designer layout your advertisement for you. Price starts at P200 for the small and simple ones. Simply contact Dexter at +63915 -283 – 0038, 11am – 6pm (Mondays – Sundays) for inquiries and free, no-obligation quotes. 4. How do you get my FREE “10 Strategies to Better Ads” ebook? Simply advertise with us online. After processing your Ad placecement with our billing department, simply contact Dexter at +63915 -283 – 0038, 10am – 6pm (Mondays – Sundays) and he will give you instructions on how to download your free printable ebook. Note: you will need an email address because that’s where your ebook will be sent. 5. Who do you contact if you have questions, or if you want to advertise in Baguio Midland Courier Online? For premium home page and inside pages Ads, you can reach Dexter at +63915 -283 – 0038, 10am – 6pm (Mondays – Sundays) for inquires, and advertisement placement requests. For online classifieds Ads, you can contact Baguio Midland Courier main office. Double your Ad’s exposure, advertise now!